Let's face it - business lighting is crucial. Light the way with classic wall sconces or go for a modern look with one of the pagoda style aluminum wall fixtures. Add transitional wall sconces to either side of your store entrance to welcome people with old time charm. Plus we all know that a safe, well-lit path is more likely to attract foot traffic than dark, dingy ones. In this section you can shop aluminum light fixtures that are perfect for business entrances, law offices and boutique hotels or bed and breakfasts. Usher in Victorian design with one of our 120V wall fixtures or go with the bold look of caged glass. Outdoor wall lights are offered in a variety of sizes, colors and lamping. Standard Black, Bronze and White powder coats are common throughout the product lines. And incandescent lighting isn't your only option! The Sign Bracket Store brings you Compact Fluorescent (CFL), High Pressure Sodium (HPS) and Metal Halide (MH) lamping options for high-output outdoor lighting. With attractive Outdoor Wall Lighting you will accomplish two things: essential illumination for your home or business, as well as a charming light fixture on which to gaze. 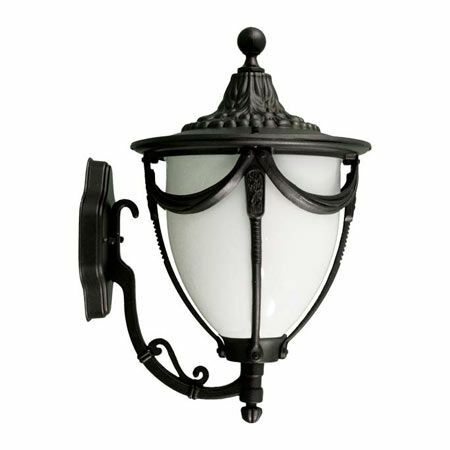 Here at Sign Bracket Store we carry a large select of outside lights, from lovely wall sconces to an outdoor lantern motif with many styles in between. Several designs of our wall light fixtures possess all the charm of European styling including the Victorian. Made using durable cast aluminum that is further protected with a baked on powder coating, the Victorian wall light fixtures are available in two styles. One style rests on a lovely curved arm from the bottom. We also carry the reverse style which is suspended from above. Each Victorian fixture provides ample illumination for customers and visitors to see through the clear antique style glass globe. All of our exterior wall lights in this section are manufactured for 120 volt circuitry with some possessing variable wattage options. Most recommend using 60 watt bulbs and incandescent source illumination. Aluminum fixtures are powder coated, with most styles available in three color options: black, white or Verde green. No matter what color you choose, the baked on powder coat resists rust and is heat resistant. While several fixtures come with glass globes, others are manufactured using the highest grade acrylic lenses, providing a shatter resistant alternative. Most exterior wall lights in our inventory are available in several sizes too, providing dusk to dawn light capabilities in all areas you need illuminated, from a side service door to the front entrance. Perfect for most small to mid-sized businesses and approved for use in wet locations, we are confident you will find what you need for your business exterior. Besides the old world look of our Victorian Wall Lamps, we also carry numerous other styles to complement a variety of exterior decors. If you are looking for something with an Eastern theme, check out the Pagoda Arch Wall Fixture in either the bottom support or reverse arch style. We also carry the Decorative, Ornate and Old Time wall fixtures, as well as the Acrylic Globe, Shepherd Hook and Caged Glass designs. Several of the above styles are available as either support bottom or reverse arch from the top.